Abu Dhabi is a very wealthy place. The capital and largest city of the United Arab Emirates has oil reserves for generations to come and is economically diversifying with incredible tourist facilities and attractions. Many people often assume Abu Dhabi is similar to Dubai but, in fact, it’s quite different in the way it’s going after tourism dollars. Abu Dhabi has a lot of offer travelers: luxurious hotels, world-class sporting events, museums, palaces, and modern architecture. However, for me, there are two things you must do in Abu Dhabi. First, you need to visit the Sheikh Zayed Grand Mosque. This is a no brainer, no questions asked, mandatory, excursion. The Grand Mosque is technically the eighth-largest Mosque, by size, in the world. However, it is the nicest, grandest Mosque on earth and I don’t even think this is an arguable point. It is simply breathtaking. When you first see the Grand Mosque from the motorway you will be taken aback by all the domes, shapes, minarets, and the pristine white color. As you approach and get closer, you still think it’s fake. It’s not until you really get right up to and in it that you realize how amazing it truly is. Hopefully, my photos can do it some justice but the truth is you need to see and experience it in real life. The entire Mosque is made of white marble. Every detail is intricate and first class. The Sheikh Zayed opened in 2007 and no expense was spared in creating it. I was there for my first time in 2008 and again in 2010. This time, I just took it all in. You can go to the Grand Mosque at any time of day and the natural sunlight will make it appear slightly different at different parts of the day. You can also go at night, which is also special. You must dress conservatively, which means being completely covered up for women, including the hair and long pants and shoulders covered for men. It’s their Mosque and their customs, so you must adhere or they won’t let you in. Be respectful. When you go inside, take note of the world's largest carpet and chandelier. Abu Dhabi, much like Dubai, always strives to be the world's biggest, longest, highest, largest, etc. Accept it and move on! It’s truly beautiful. Not to gush, but you cannot take your eyes off the décor. Everything is impeccable and immaculate. I have such respect for the attention to detail. The entire Grand Mosque for me is certainly one of the 30 best man-made sites in the world. In fact, it may well be in the top 10! The other thing you must do in Abu Dhabi is a 4x4 safari adventure in the desert. A fleet of Land Cruisers picked us up at the port where the Azamara Journey was docked. We then drive in unison about 45 minutes into the desert. Then the fun started! The drivers are excellent and they bash the massive sand dunes populating the desert around Abu Dhabi. You feel like you’re on a roller coaster at times, and it’s even more fun because of where you are. Aside from the driver, you’ll have 4 passengers maximum in the 4x4. I recommend sitting in the front for the best view but anywhere you sit you'll have a blast. The best thing is you’ll pass camels along the way just hanging out. Plus you can see forever over the dunes. If you’ve ever been in the desert, you know how beautiful that can be. The tour includes stops at a camel camp for photos. They also offer sandboarding down the dunes. It’s a lot more complicated than it looks! Plus you can dress up in traditional Arabian dress and get some great photos…or selfies in my case! In my opinion, these are the two things you must do in Abu Dhabi and they should not be missed. You can be any age for the 4x4 safari because you are strapped in pretty good and it’s not that fast. Just hold and be ready for some fun! 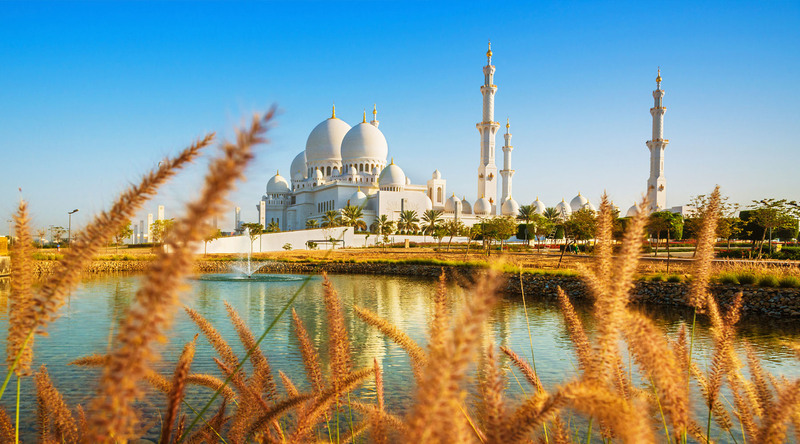 Browse Azamara's two upcoming voyages to Abu Dhabi here.